Do you want to clean your car properly? Simply using Autosol, a great German cleaning product to clean your car will ensure it always looks and remains looking the very best it can. Some history: In 1929 Mr. Durst, a chemist turned inventor and entrepreneur and his miracle inventions are part of a legacy that will live on for decades to come. Even today the Company is still a family owned business and prides itself of having a broad base of Customers’ worldwide across many industries which it services personally. In order to guarantee your 100% satisfaction DURSOL uses only first-class materials from leading suppliers. Today DURSOL produce and distribute a full range of cleaning and care products for automobiles, as well as for industrial, commercial, private and trade use. DURSOL comply with the strictest manufacturing regulations in order to meet the quality standard we have set in our company. The DURSOL factory operates on an international scale. Many of our products have been awarded Gold Medals by the independent consumer testing organisation “Monde Selection” from Brussels in Belgium. The easy to dispense Leather cleaner paste cleans thoroughly and freshens up natural leather as well as synthetic leathers. It revives the depth of colour as well as the elasticity of the leather whilst creating a matt shine. The leather care emulsion leaves behind protection layer which prevents brittleness and abrasion, yet allows the leather to breathe. High quality oils preserve the leather’s natural characteristics. Please note that, whilst this kit is not suitable for Suede, it can be used for leather in motor cars, bikes, saddles, lounge suits, bags, jackets and boots. 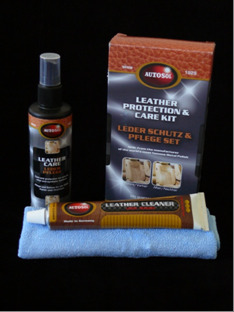 It’s an all-round excellent product to revive your treasured leather items. 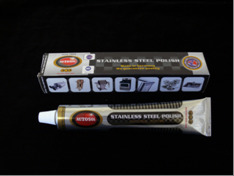 This product has been especially formulated to clean and protect stainless steel, resulting in an extremely high lustre without scratching. It is also NSF approved, hence eco-friendly, an important aspect in today’s “converting to Green” mind set. It’s ideal to clean exhaust pipes on motor vehicles.